This is a bit of a fall back recipe for us on weeknights. It’s super simple and pretty healthy but there’s also something really nice and tasty about it. We think you should try this one! We grill an extra salmon fillet for our 3 year old (without the chillies) and she loves it with the ginger rice. Wine Suggestion: Riesling, pure and simple. Try the vibrant Weingut Korrell “Slice of Paradise” dry Riesling from the Nahe in Germany, or if you want to push the boat out their Kreuznach Paradies Riesling, a full-throttle, powerful and dry Riesling with delicacy and a light touch despite the power and body. Even better if you can hang on to it for a few years and get the benefit of development in the bottle. Heat a tbsp of the oil in a pan and fry the onion for a few mins until lightly browned. Stir in the ginger and garlic, fry for another minute, then stir in the rice. Add 300ml boiling water and a little salt, then bring to the boil. Cover and cook for 10-12 mins or until the rice is tender. Meanwhile, heat the grill to medium. Brush a baking tray with a little oil and place the salmon fillets on top. Grill for about 4 minutes, then scatter with the chilli, coriander, the other tbsp of olive oil and some seasoning. Return to the grill for another 4 minutes or until the salmon is cooked through. Serve the salmon on top of the rice with a piece of lime to squeeze over. So here we are in October which in our house means thoughts are turning towards Autumn veg, warm casseroles and roast dinners. 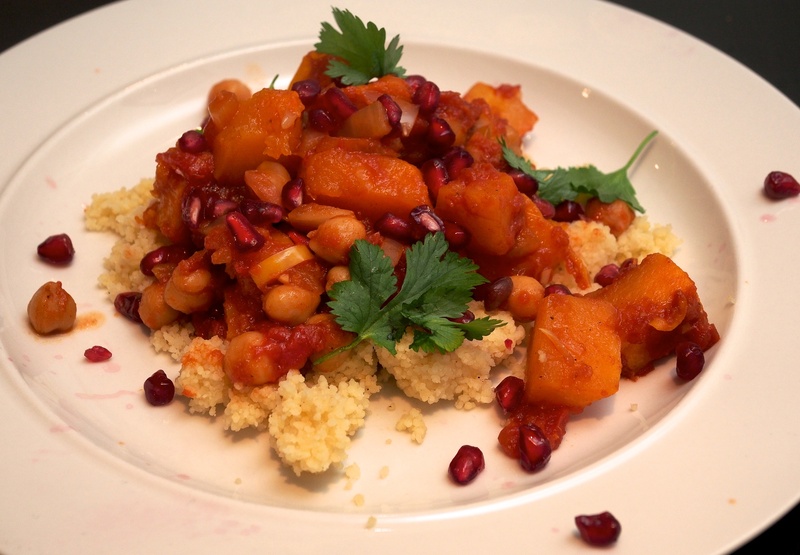 Here’s a really delicious, but healthy, idea for your first butternut squash. Wine Suggestion: A little tricky this match but we have two suggestions: a juicy and spicy, Californian Zinfandel – get a good one if you can, like Cline or Ridge; or the Altos de Torona Albariño, a richly fruited white with spices and textures to complement the spices in the dish. Put the tomatoes on a baking tray lined with baking parchment, drizzle over 2 tbsp olive oil, season well and roast in the oven about 20 minutes. Meanwhile, pour 2 tbsp oil into a large saucepan and add the squash, thyme, garlic and onion. Season well and cook over a low heat for about 15 minutes or until the vegetables start to soften.Add the tomatoes, chickpeas, bay leaf, cumin, cinnamon, turmeric and harissa. Season and pour in the stock. Bring to the boil, then simmer for 30-35 minutes or until the liquid has reduced. Mix the feta with the last tbsp of olive oil and the lemon zest in a small bowl. Add the ground coriander and cavolo nero to the stew and cook for a couple of minutes. Put the stew into bowls and top with feta, some coriander leaves and fennel seeds, and some seasoning. Serve with the lemon wedges. This one-pot dish is full of Mediterranean flavours and reminiscent of summer sun. A tasty treat for mid-week and freezes well too. Wine suggestion: try a glass of a good, dry Provençal Rosé. We had one made by Chateau Vignelaure which matched the sunny nature of this dish perfectly. Season the chicken pieces well with salt & pepper. Heat a splash of oil in a large shallow casserole and fry the chicken until the skin is golden brown. This should take about 10 minutes and is easier to do in a few batches. Remove the chicken onto a plate. Pour most of the fat off the pan, then add the onions and garlic and fry for over a low heat for about 8 minutes or until very soft. Add the tomatoes, peppers and rosemary and simmer for another 10 minutes, breaking the tomatoes up with a wooden spoon. Add the wine and simmer for 20-30 minutes or until the sauce is rich and thick. Stir the olives into the sauce and nestle the chicken pieces back into the pan. If your pan is too small to take the chicken in a single layer you can transfer everything to a baking dish at this point. Cook in the oven for 30 to 40 minutes or until the chicken is cooked through and comes away easily from the bone. A healthy salad for lunchboxes and a good use for red cabbage which always seem impossible to get through. If you have a mandolin it will make short work of shredding the vegetables. Cook the noodles according to the instructions on the packet, then rinse under cold water and drain well. Whisk 2 tsp of the sesame oil, the lime juice, peanut butter and rice wine vinegar together in a large bowl. Add a splash of boiling water if the dressing appears too thick. Add the noodles, carrot, pepper, cabbage and sugar snaps and toss to coat. Divide between 2 containers and scatter with the scallion and sesame seeds. This is a good chilli for mid-week. It uses turkey mince which is lean, and easy to pick up now in supermarkets. It’s not lacking in flavour and we will definitely be doing it again. Wine Suggestion: a lighter Spanish red is the trick here; make sure it doesn’t have too many tannins. Our find of the moment is a rarity from Teruel, in Aragon which has a harsh climate of hot summers and very bitterly cold winters. From a resurrected-reinvented vineyard the Jesus Romero Rubus is an unoaked blend of Garnacha, Tempranillo and Syrah. The beauty of this wine is the purity of fruit that sings and layers itself across the palate and has a very long finish. Never heavy, yet full of life. That said, it’s mid-week, so go for it, have whatever is open and it’ll be grand! Prick the potatoes all over with a fork. Rub with a little oil, and bake for 20 mins, then turn the oven down to 200ºC and cook for 45 mins-1 hour depending on the size of your spuds. Meanwhile, heat the remaining oil in a large frying pan over a medium heat. Add the onion, garlic and some seasoning, and cook for 5 mins until soft. Add the turkey mince and season again, then increase the heat and break up the mince with the back of your spoon. When it’s cooked through, add the spices, vinegar, sugar and passata. Reduce to a simmer and cook for 10 mins or until the liquid has reduced. Cut a cross in the potatoes and serve filled with the chilli, some chopped scallions and grated cheese. We like to use the Thai curry pastes that come in plastic tubs, Mae Ploy is a good one. There’s always more in the tub than we need which forces us to search for lots of recipes to use it up. This is a bit different for a weeknight, tastes really good and is healthy too. Wine Suggestion: a light aromatic white is what we’d suggest, like a QbA or Kabinett Riesling from the Mosel. They tend to have a welcome low alcohol (7 to 9 % abv), delicate and vibrant fruit and a refreshing zing to cut through the little bit of residual sugar. A dry Riesling doesn’t work as well; the touch of sweetness helps balance the chilli and curry paste perfectly. Put the salmon, curry paste and coriander in a food processor. Pulse until roughly chopped, then form into 6 fishcakes and chill while you make the salad. Mix the rice wine vinegar and sugar until the sugar dissolves, then add the ginger. Toss all the other salad ingredients together with the dressing. Heat the oil in a non-stick frying pan. Cook the salmon cakes for 2-3 minutes per side until golden and cooked through. Serve with the salad.